Should Captives Agency Owners Consider The Independent Agency Option? State Farm, Allstate, American Family and Farmers has nearly 50,000 Agencies. Many of these agency owners are perfectly happy with their careers with the carriers. However, some captive agents may look at their peers with independent agencies and wonder whether that path may be for them. For some, the answer may be yes. There are advantages to being a captive agent. Joe Totah of Strategic Agencies, LLC, a former captive agent who started his own independent agency, describes being a captive agent as a hybrid between being an employee and owning your own business. “A captive agency provides a turnkey package for those who want to run their own business without some of the challenges of having an independent business,” he says. Captive agencies get outside help that independents do not get. This includes things like office allowances, subsidies for the first few years, leads, advertising help, and technology assistance. When the carrier has the underwriting appetite and pricing, a captive agency can write large volumes of business. Houston agent Rob Lopez had great success writing property coverage as an exclusive for Allstate in the 2000's. “I made my reputation by working closely with realtors and mortgage professionals during the middle of what later became the housing bubble,” he says. Lopez's experience also illustrates an advantage of becoming an independent. In 2005, three hurricanes hammered Houston and Allstate's desire to write property coverage there dried up. Lopez sold accident and life insurance to cover the revenue loss, but his frustration mounted. He eventually accepted a buyout from Allstate and opened an independent agency. 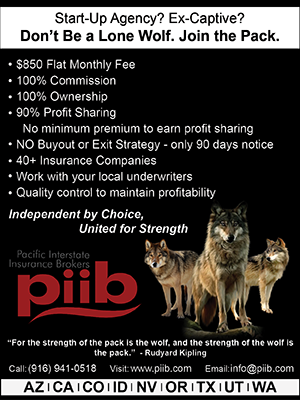 Alternative markets are not the only advantage independent agents have. There is also freedom to choose the business's direction. O'Reilly reached a point where he and his carrier wanted different things. “Their goals didn’t line up with my goals and it was just time for me to go independent,” he says. Still, Totah notes that becoming an independent is not for everyone. For one thing, independent agents have to do all those things that captive carriers do for their agents. Generating leads, making appointments, buying computers and installing a network, purchasing an agency management system – independents have to do all these things themselves. Once an agency has its own carrier appointments, some co-operative advertising dollars may be available, but agents should not expect that the first few years. Totah further states that Independent Agents are not limited to an agency-in-a-box and as a result there is greater opportunity for higher revenues. This is prefect for motivated agents who want to take their agency ownership to the next level and further want to have a great role in how their agency is run. Basically Independent agencies have more freedom. Inexperienced agents should wait. Totah and O'Reilly both say that agents should have a minimum of three years' experience before going from captive to independent. Totah's guide to starting an agency goes further, advising agents to have five years' experience. One obstacle former captive agents can run into is the non-compete agreements they signed with their carriers. Lopez took the attitude of assuming that he would never count on getting a single client from his Allstate book. Instead, he focused on obtaining new clients and getting referrals. Totah advises becoming active on social media to help maintain contact with clients of their captive agency as this may come in handy, most especially after the non-complete expires. However because each state has different non-compete laws and each non-complete/non-piracy contract may be different, it's best to consult with an attorney on the legalities of maintaining contact with clients in such a manner. A new independent agency needs markets. Totah and Lopez both encourage new independents to join agency networks, also known as “aggregators.” Stein says they are necessary for property-casualty business. “The time savings more than pays for the aggregator charges,” he says. In addition to providing access to carriers, they offer knowledge and guidance, and can serve as the agency's virtual staff. He cautions that aggregators vary greatly; it is important to find the one that is the right fit for the agency. Lopez advises growing slowly with a plan, rather than taking on too many carriers at once and having to struggle to please them all. “Stay focused on quoting and closing sales,” O'Reilly says, “and do your administration very early in the morning or late at night.” He adds that both production and profitability should be kept foremost in mind “or the carriers will abandon you.” Lastly, starting an agency is not an employment opportunity, like any other business it's going to take an investment and agents that invest in policy growth will likely achieve profitability sooner than those who don't.